Two years ago a member of my CCRC fitness center came to me and asked if I had ever heard of pickleball. I told him I hadn’t, so he explained it to me. A month later a member of our sales and marketing team asked me the same thing; this made me do a little research of my own. Pickleball is a paddle sport that combines elements of tennis, badminton, and ping-pong, and results in a senior-friendly game that addresses the many health concerns seniors are faced with every day, like poor balance and hand-eye coordination, depression, and the many symptoms usually associated with decreased cardiovascular fitness, such as high blood pressure, diabetes, and obesity. 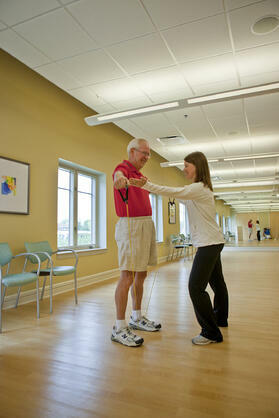 We all know someone who is not quite steady on their feet; that person might even be you. Well, what if I told you pickleball could help with that? Pickleball has a unique set of rules, mostly regarding volleys (hitting the ball before it hits the ground), that favors people with less mobility and poor balance. The decreased amount of volleying combined with the slower-traveling whiffle ball is great for a beginner, and someone with poor balance who needs a little more time to recover after hitting the ball away. The large whiffle ball is also easier to hit than a traditional tennis ball. Pickleball is played on a court that is 20 x 44 feet, so it is a lot smaller than a tennis court, which requires the player to cover less ground. When you combine less volleying, a slower ball, and a smaller court, you get a pretty free-flowing game with fewer interruptions, which means great exercise. Pickleball is played by over 2.46 million people in all 50 states, so you don’t have to look far to find a league or people with experience playing. When I began my pickleball research, I found that a church less than 5 miles from my community had a league that played weekly. I also found that our local YMCA had a regular playing league, and both leagues encompassed people of all ages, fitness levels, and experiences. All it took was one quick phone call and the church welcomed our seniors to their next session. The first night we took about eight residents who had shown interest. Not a single resident we took knew how to play before going, but after a short tutorial they were all on the court and loving it! The most amazing thing was seeing a resident with Parkinson’s disease get on the court and have no problem playing. 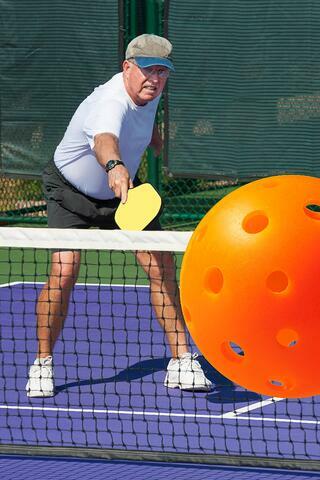 If you are looking for a place to try pickleball, I suggest checking with your local continuing care retirement community or community center, or contacting a tennis facility. If you are a visual person and want to see pickleball in action, look at this video done by the Early Show. 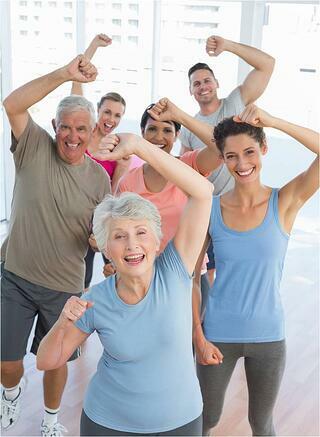 Check out some of our best practices for wellness programming for residents, get creative to get them coming back for more! Depending on where you live, if you drive yourself to work, your daily commute could be up to 90 minutes each way. The average American will spend 25 minutes commuting to work according to U.S. census data. Unfortunately, this is taking its toll on your overall health in more ways than the obvious: accumulating even more minutes of sitting throughout your day. Let’s talk about what is really happening to your health as you are driving yourself to and from work each day, and what you can do about minimizing those negative effects by replacing them with positive habits you can incorporate into your commute. 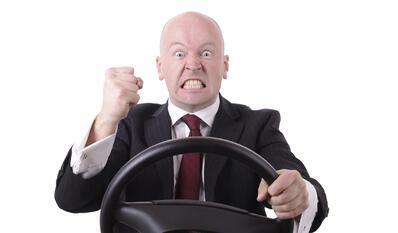 Traffic Jams, Weather Delays, Road Rage = Another Opportunity for Stress! There are things that happen on our commute that we did not plan on that put us behind on our already hectic schedules or just annoy us. It is easy to become anxious when these things happen and start or end the day with added stress from the experience. The truth is these things are typically 100% out of your control, so this should not be a source of stress. Next time you find yourself in this situation, simply take a few deep breaths. According to the American Institute of Stress, to decrease the damaging effects of stress on the body you should take focused and intentional deep breaths. This will allow you to truly relax by decreasing your heart rate, breathing rate, and blood pressure, thus decreasing your overall response to the added stress. When you have to sit for long periods of time, make sure you are sitting correctly. This comes back to ergonomics, but setting up your car to meet your needs has many elements to consider. The USDA APHIS Ergonomics Program does an excellent job of teaching you how to set up your driver’s seat properly as well as the risks associated with not setting it up correctly: increasing your risks for low back pain, neck strains, and many other common musculoskeletal injuries. Take a few minutes to properly adjust your vehicle to prevent these issues from occurring. Research from Washington University has shown a high correlation between longer commutes and increased prevalence of various health conditions such as metabolic syndrome, obesity, and high blood pressure. An obvious way to combat this is to ride your bike or walk to work, but realistically this is not always possible for many adults. Sometimes the commute is simply too long, or the city you are working in does not have the infrastructure to support this. When commuting by foot or bike is not possible, it is even more important to find time for physical activity at some point during the day to help minimize these risks. 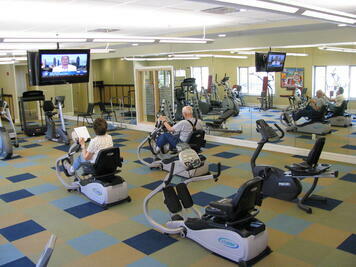 One way that you can do this is to use a fitness facility on your way to or from work. This is a great option because not only will it allow you to access activity, but it will break up the time you are spending in your vehicle. If you have the option of using public transportation, your options here can be endless! One study has shown that people who use active travel (walking, public transportation, and biking) compared to those who drive themselves to work report higher levels of positive well-being. If active travel is not an option, maybe you enjoy listening to music, audiobooks, podcasts, or just being alone with your thoughts. The commute can provide a great opportunity to do these things. Many take this time as an opportunity to learn more in an area that they are interested in but just can’t seem to find the time to do, or to simply just unwind from their hectic schedules. Although the commute is likely not your favorite part of your day, it does not have to completely derail your employee health if you take these things into consideration. Take a few minutes this week and reflect on your commute and think about where you may be able to incorporate some of these healthy habits to improve upon and maintain your good health. 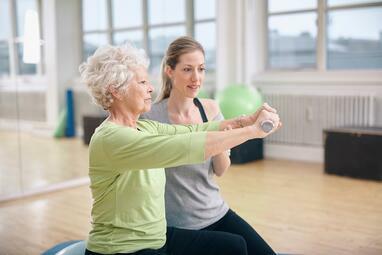 Consider how you can provide better wellness and fitness services to your employee, click below for ideas from NIFS.